If you were asked to list best sporting nations in Europe, it may well include The Netherlands. They’ve been one of the highest finishing European countries at the last two Olympics and consistently excel at the likes of football, hockey and skating. Their involvement in F1 began all the way back in 1948 with the introduction of the Dutch Grand Prix, held at Circuit Zandvoort. Four years later, the track would play host to the nation’s first ever drivers, Jan Flinterman and Dries van der Lof. Flinterman, who was a pilot for the Dutch air force during World War Two, finished in ninth place, while Van der Lof retired 70 laps in. It would be the first and last race for both of them. In the coming decades, The Netherlands would often have drivers on the grid, but none would enjoy a huge amount of success. From the 50’s to the start of the 90’s, seven Dutch drivers competed on a regular basis, scoring a total of six points between them. To make matters worse, in 1985 the Dutch Grand Prix was taken off the calendar. By the end of the 80’s the national football team had just won the European Championships, but there was little for the country to be excited about in Formula 1. This finally changed in 1994, with Jos Verstappen’s arrival. Verstappen Senior had impressed in Formula Opel Lotus, where he won the European Championship, and Formula Three, where he won the German Championship, and was therefore one of the most highly sought-after young drivers around. He would soon get his first chance in an F1 car when he tested for Footwork Arrows, and his strong performances drew interest from across the grid. He was subsequently signed to be Benetton’s test driver for the 1994 season but was given the chance to drive the car in the first two races after regular driver JJ Lehto broke a vertebra in pre-season testing. The Dutchman would go on to compete in 10 races that season, getting two podiums in the process and impressing alongside team-mate Michael Schumacher. This would prove to be the peak of a solid if unspectacular career; 17 points over the course of 107 races may not seem impressive, but if the modern points scoring system had been present, that would’ve been a much more respectable 115. More importantly though, he opened up the door for Formula 1 in The Netherlands. If you were to search on YouTube, you could find Ted Kravitz’s first F1 TV appearance all the way back in 2001. In this appearance, he does a piece to camera on Jos Verstappen, in which he says people from Dutch TV claimed “Jos the Boss” was their country’s “Damon Hill, Nigel Mansell and Murray Walker all rolled into one”. This goes to show the impact that Verstappen had on the nation. Prior to his arrival in the sport, nobody there really cared about it, and they wouldn’t for some time after either, but Verstappen Senior’s moment in the sun was a sign of things to come. His biggest contribution to the sport undoubtedly came in the form of his son, Max. In the years between father and son, The Netherlands would experience more dark times in Formula 1. The likes of Christijan Albers and Giedo van der Garde came, sat at the back of the grid for a few seasons, and went. On face value, it may have seemed that the Dutch F1 culture had come and gone in the same fashion. Thankfully though, far away from the grid girls and TV cameras, Jos Verstappen was mentoring his son up the world of motorsport. 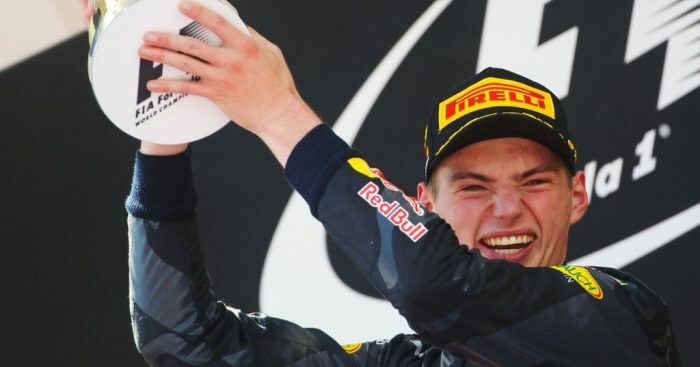 In 2015, Max Verstappen would become the youngest ever Formula 1 driver at the age of 17. Max Verstappen’s impact both on the sport and on his country cannot be understated. As well as being the youngest ever driver, he would also be the youngest ever race winner and the first ever Dutch one, and is already the most successful Dutch driver of all time quite comfortably, at the age of 21. It wouldn’t be unfair to say that he’s now the country’s biggest sportsman, let alone F1 driver. In 2015, he was the first ever racing driver to win Dutch Sportsmen of the year, and he is now the highest paid Dutch athlete in the world. His success has single handedly propelled F1 to the top of the list of The Netherland’s most popular sports. When he won the Mexican GP last season, two million people in the country tuned in, a whopping 11% of the entire nation. There are many that take things a step further and go from their sofas to the grandstands. Verstappen may not technically have a home race at the moment, but such is his popularity and the dedication of his supporters that the Belgium GP has been dubbed exactly that; in the past two years, around 60,000 Dutch fans have attended the iconic race – orange is now the dominant colour there, and it’s not because of the McLarens. The fans go further than just Belgium though, with Austria, Germany and Hungary also having a “Max Verstappen Stand” at their races. Granted, the rise of Verstappen and Formula 1 may have been helped by the fall of the national football team coming at the same time, but it’s been a meteoric rise nonetheless. Looking ahead, it seems that F1 is only going to grow more and more in the country. Verstappen continues to go from strength to strength, a Dutch GP returning to the calendar is looking increasingly likely, and the likes of Richard Verschoor and Nyck De Vries could well take up spots on the grid in the future. It’s fair to say that for Dutch F1, the future is bright. Bright orange.